Came over from the Virtual Sketch Date. Hope you settle in happily to your new home. Whenever I move, I can remember where things "used to be", and it takes a while to realize that they are now in a new place! Very good work with the pastels. I think you will find the transition from oils to pastels quite fluid. Just work from darks to lights and it will be all good. Leslie, miki willa - thanks for the words of confidence. 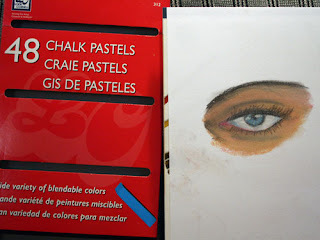 I have decided to use pastels for the virtual sketch date this month. For the first time in many years I am not going for realism. I have been spending some time helping my Mother shop for furniture. The furniture stores are filled with impressionistic art prints and originals. So, I have decided to go impressionism this time. I am not sure that I like it, but it does remind me of what was hanging in the stores. I will post it on Saturday morning or Friday night. I do welcome all comments, but good and bad.